The Cuban In My Coffee: Could it be....love? Just wanted to post a few inspirational photos that I found and am crushing on. Nothing like my favorite color palette to keep things large and in charge, but mixed with some really nice organic woods. I am so fond of mixing a piece of wood in here and there......and everywhere. Good evening and stay tuned for the finished floors and the tales of travertine tomorrow (yes, there have actually been some stories to tell here). 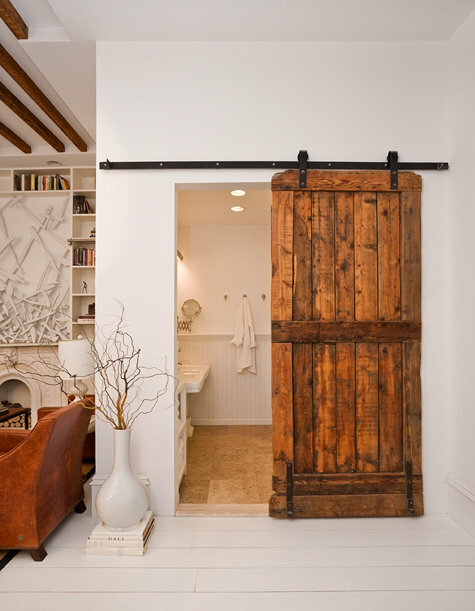 I wish I had a place for a sliding barn door. I love the look. Perhaps we can incorporate one into our basement if we ever decide to use it as something besides storm shelter and storage.